This four star attraction offers visitors a range of facilities and services for an educational or a fun day out. 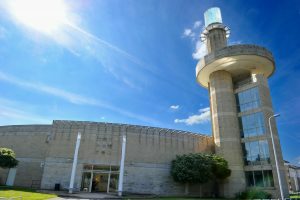 Visit www.traveline.info for information on how to travel to North Lanarkshire Heritage Centre from your location. You’ll find us at High Rd, Motherwell, ML1 3HU. At North Lanarkshire Heritage Centre we have regular kids and adult activities, as well as exhibitions. Check out our upcoming events to find out more. For meetings with a difference, consider our conference room. Audio-visual facilities and a choice of seating arrangements are available. Catering and Wi-Fi access can be arranged. Contact us on 01698 274590 for more details. The Centre provides a range of workshops for nursery classes and primary schools and offers loan boxes on various topics. Please ask for our current What’s On Schools brochure for more details or phone 01236 638 452 for more information. Climb Thru Time – Look out for our exciting redevelopment of the six-level tower into a permanent exhibition space where you will be able to explore the history of the Motherwell area from pre-history to the present. The tower – a distinctive feature of the local landscape – also offers visitors a viewing platform right up and down the Clyde Valley, over to the Campsie Fells and even to Ben Lomond, if the weather permits! Fully accessible lift. Free entry. Stairwell Gallery – Why not exhibit your own works? Our Stairwell Gallery provides the perfect location to display your own works of art. Archives and Local Studies – Visitors who wish to research their local or family history can do so in our friendly local history room on the first floor. Here all are welcome to explore North Lanarkshire’s extensive historical archives collections which span from the 15th century to the present day and include poor relief records and cemetery day books. The Local History department also holds a wide range of resources covering the areas of Motherwell, Bellshill, Shotts and Wishaw (Old Motherwell District) and offers one-to-one advice and guidance on researching your family tree. Please ask for our more detailed Archives and Local Studies leaflets or call 01698 274590 for more information. Curatorial Services – You can also access the museum collections which relate to Motherwell and the surrounding area and which are located within the museum store. Curators are available every Wednesday in the Heritage Centre if you have a potential object you would like to donate or if would like to view objects from the collections. Exhibitions tours – Our curators are available for tours of current exhibitions. Please contact 01236 856373 for more information. Shop – There is a small shop selling a range of books, DVDs and postcards on the local area as well as pocket money toys and sweets. Copies of photographs of old North Lanarkshire can be purchased from our Archives and Local History departments. Refreshments – We have a small seating area with a vending machine and coffee/tea maker for visitors to use. Please call 01698 274 590 for more information. Like to know more..? For more information call the number on the right hand side of this page.